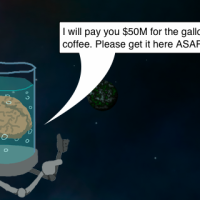 Today I have a game for you called Warped Space and it is the first game I have ever played that describes itself as a “gravity game”. Naturally, I had to take a look! Warped Space by Marshsmith Inc.
Warped Space takes you on a space adventure that involves the use of gravity to achieve your objective. 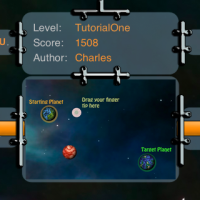 Each mission has a stated goal which is to deliver objects from your starter planet to the target planet. 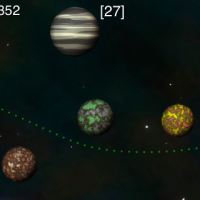 In the middle between the start and end points are usually a few other obstacle planets, which become the key to your high score. At the beginning of each mission, you are assigned the task to deliver an object to the target planet, which is usually across the screen. You use your finger to aim the target line toward your destination and you may fine tune your shot by using a visible gray circle near the bottom of the screen. However, simply getting to the target planet will not get you any decent score. Your real goal is to keep yourself in flight for as long as you can while staying under the 30 second timer. In order to do this, you want to stay near the other planets, because as you get closer to them, your flight path begins to spin around the planet and that gains you more score. However, if you do not aim your flight path correctly, you will spin off into space and get no score at all! You can view a gameplay video here. In my play tests, I found the controls to be somewhat intricate, as it was difficult to get a respectable high score per mission. 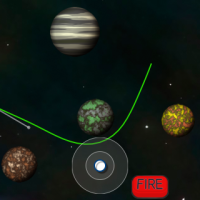 Getting to the target planet was easy, but using the gravity around the planets and actually keeping yourself in flight in order to get a high score was quite difficult. I found my flight path to spin off into space and lose everything more often than I was actually winning. The basic premise of the game is understood, but the controls are finicky. However, the game does offer two tutorial levels that do help you to get a hang of the controls. Controls aside, Warped Space offers amusing and challenging gameplay with good visuals. While the missions have essentially the same goal, it is achieving that goal that provides the challenge. The game even adds a little bit of humor when it presents you with your missions, which I found to be a hit or miss as it really depends on the type of humor that you enjoy. Overall, if you are looking for a game that provides you with a solid challenge and good replayability value, Warped Space is a good choice. Warped Space is scored a 4 out of 5. 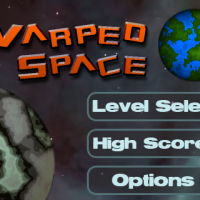 You can check out Warped Space in the iTunes App Store for $0.99.